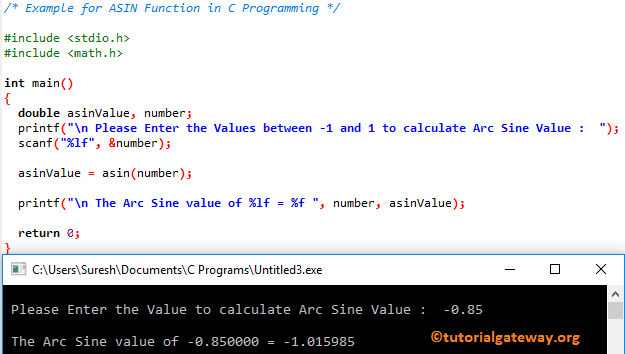 The ASIN Function in C programming is one of the Math Library Function, used to calculate Trigonometry Arc Sine value for the specified expression, or value. In this article we will show you, How to use this ASIN function with example. TIP : Please refer SIN Function article to calculate the Sine value of specified expression. The basic syntax of the asin in C Programming is as shown below. The asin Math Function helps you to find the trigonometry Arc Sine for the user specified values.